The present work is the result of a cooperation between the research group LLACAN Langage, Langues et Cultures d’Afrique Noire of the CNRS (Centre National de la Recherche Scientifique) and the University of Bayreuth within the framework of the Projet International de Coopération Scientifique (PICS). The aim of this collaboration was to develop a comprehensive typology of adjectivization and qualification in West-African languages, done by way of comparatively analyzing thirteen languages of diverse language groups and families. This volume presents the results in a clear and concise way. Paulette Roulon-Doko: Gbaya (Zentralafrikanische Republik). The appendix conveniently lists twelve sample adjectives of the seven primary semantic groups according to Dixon (2004) – in English and in French –with interlinear translations for all 13 languages (compiled by Kerstin Winkelmann). This inspirational study will be followed by another volume, which is being prepared for edition by B. Caron and D. Ibriszimow, and which is impatiently awaited. [...] every chapter has some discussion on the exact identity of one or more of the “parties du discours”, and the problems encountered reinforce one’s doubts on typology as a science rather than an art. 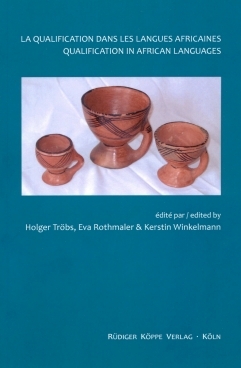 As we have a book where a chapter is devoted to each language we can least see the reasoning and examples for the use of the labels in each particular analysis, thus avoiding the unfortunate over-simplification that would have resulted had the findings merely been summarised and reported in a journal article, though such an enterprise might now be useful with this book available as a resource for anyone needing to check details. [...] This book is welcome as a useful addition to the growing literature on this hitherto-neglected aspect of African languages (and, in spite of Bhat, Dixon et al., language in general).